Ireland clinched their third Triple Crown in four years with a hard fought win over Scotland at Murrayfield. Ronan O'Gara charged down a kick from Dan Parks and went on to score the only try in an error-strewn match. O'Gara's boot provided the rest of Ireland's points, while Scotland had to rely on the kicking of Chris Paterson. Paterson scored six penalties as Scotland moved in front briefly midway through the second half but the home side could not hold on to their lead. Backed by a large travelling support, Ireland edged ahead in a scrappy first half but their play deteriorated after the interval and they had to come from behind to sneak the win. Scotland were looking to atone for their hapless loss to Italy and they battled hard to upset their opponents. However, the Scots were bereft of attacking ideas and never threatened to score a try. BBC Sport's player ratings - do you agree? O'Gara kicked the game's first points after seven minutes but, despite a series of powerful Irish surges, the game was level when Paterson slotted over a penalty eight minutes later. The home crowd were on their feet when Sean Lamont set off on a blistering run and fed the supporting Paterson but the Scotland skipper was caught inside the 22 by Denis Hickie. The floored Paterson was caught on the head by Peter Stringer which sparked a minor brawl and a few minutes later Irish captain Brian O'Driscoll was fortunate to escape with a warning after lashing out at several opponents. The Scots were guilty of gifting Italy soft tries and once again they were the architects of their own downfall when a Parks kick was charged down by O'Gara. Gordon D'Arcy and Simon Easterby exchanged passes and O'Gara followed up for a simple try, which he converted. Scotland replied with a break to within five yards of the try line but a careless knock-on saw a promising move fizzle out. Paterson added two penalties and O'Gara bagged another before the half-time break came, with the Irish leading 13-9. Scotland were dealt a blow immediately after the restart when Nathan Hines was sin-binned for not rolling away and slowing play down. O'Driscoll sprung two great breaks but Ireland could not take advantage of their advantage in personnel. Shane Horgan was guilty of a poor forward pass when a try looked certain and Lamont stopped Hickie just inches from the try line with a great tackle. Having survived those scares, Scotland reduced the deficit to one point when Paterson added a long range penalty. And on the hour the Scots were in front, with the reliable Paterson again knocking the ball between the posts. Paterson extended the lead with his sixth successful penalty as Ireland continued to make mistakes. But the hosts were just as jittery and O'Gara hit back with two quick penalties right in front of the posts to seal a single point victory. Scotland: Southwell; S Lamont, Di Rollo, Dewey, Paterson (captain); Parks, Cusiter; Kerr, Hall, E Murray, Hines, S Murray, Taylor, Callam, Brown. Replacements: Ford, Jacobsen, Hamilton, Hogg, Lawson, Henderson, R Lamont. 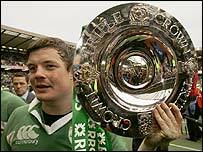 Ireland: Dempsey; Horgan, B O'Driscoll (capt), D'Arcy, Hickie; O'Gara, Stringer; S Best, R Best, Hayes, O'Callaghan, O'Connell, S Easterby, D Wallace, Leamy. Replacements: Flannery, B Young, M O'Driscoll, N Best, Reddan, P Wallace, Trimble.